That’s right. Acrylic powder is actually polymerized monomer. (Polymerization happens when single molecules link together into chains of molecules.) 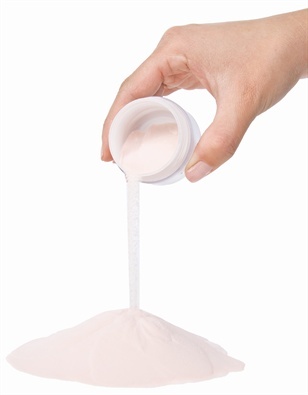 Manufacturers use a combination of different monomers, which together create a polymer, to create the powder. Often, it’s a combination of ethyl methacrylate (EMA) and methyl methacrylate (MMA). That may confuse some techs, but here’s an interesting bit of information: MMA is only prohibited in its liquid monomer form. In a polymer form (Poly-MMA or PMMA), it is completely safe. The EMA and MMA are poured into a great container that spins. As it spins, the molecules bond to each other and form perfectly round, hardened droplets: acrylic powder. Manufacturers can create different-sized droplets, such as a fine or medium powder, by changing how fast or slow the machine spins and by adding other ingredients into the formula. Activator (or Inhibitor): The activator, benzoyl peroxide, acts like a starting gunshot in a race, says industry chemist Doug Schoon. As soon as the acrylic liquid touches the acrylic powder, the catalyst in the liquid activates the initiator and a chemical reaction begins the bonding and hardening process used to create acrylic enhancements. When the liquid touches the acrylic powder, it doesn’t “melt” the powder. Instead, the liquid, which has adhesion properties, bonds all the little “droplets,” or pieces of powder, together to create the nail. Each powder particle of the polymerized monomer is coated with an activator. Colorant: Colors that are dissolved into liquid monomer or solvents are called dyes. Colorants that do not dissolve are called pigments. Pigments are usually added to the powder. Manufacturers add pigments, at usually less than 2% concentration, to give techs a wide array of different colored acrylic powders. One example of a pigment, titanium dioxide (TiO2), allows the product to come in a variety of whites. Glitter: This popular ingredient is added to increase a tech’s options to personalize her work. Manufacturers may use tiny pieces of metal-coated plastic to create the sparkle we call “glitter,” or they may choose to use thin sheets of certain minerals, such as mica. “These materials refract the light just as a prism or a dew drop,” says Schoon. Techs are advised not to add their own glitter to acrylic powder. Less is more when it comes to glitter, says Schoon. Any bit of added material used to achieve the look of glitter reduces the strength of the acrylic powder. For best results, nail techs should leave the chemistry of mixing product to the manufacturers.